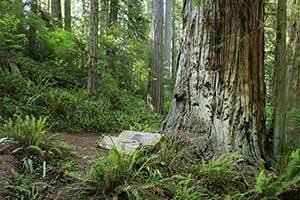 Jedediah Smith’s campground is the only place in Redwood National and State Parks where you can actually camp under old-growth redwoods. 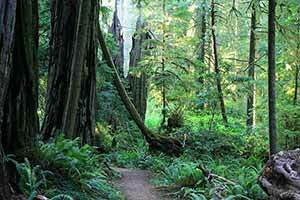 It’s conveniently just across the river from Stout Grove and some of the world’s best redwood hikes. It’s a drive-in campground, meaning you’re supposed to drive up to your campsite and pitch a tent right next to your car. 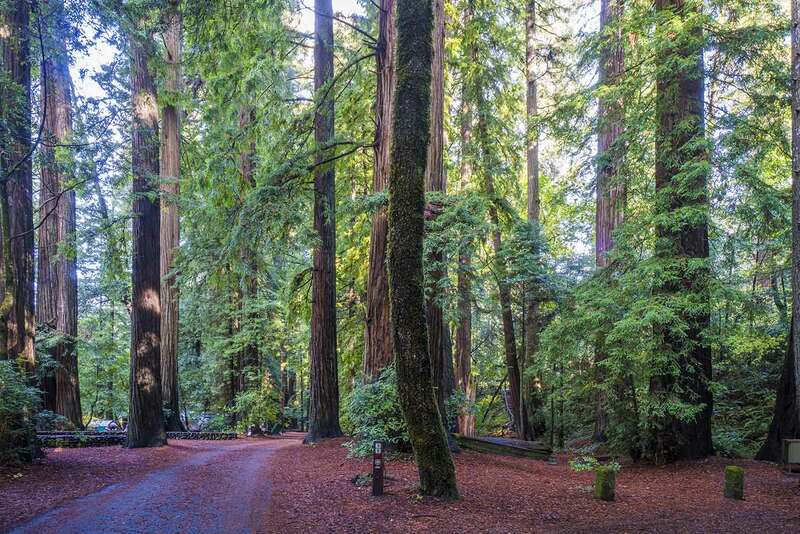 RVs up to 25 feet and trailers up to 21 feet are allowed, but typically for a state park campground, there aren’t any hookups and the narrow, twisty roads are difficult to navigate in large vehicles. 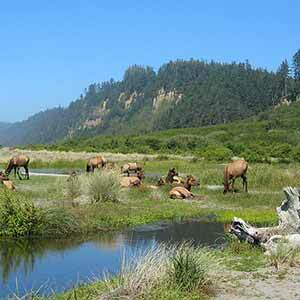 The main drawback to the campground is that it’s right next to busy two-lane Highway 199 with its high-speed traffic, so most of the campground gets traffic noise. 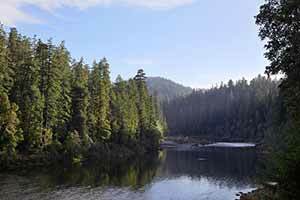 Sites 47 – 58, however, are a notable exception, and some other parts of the campground are far enough from the highway that the noise isn’t too bad. 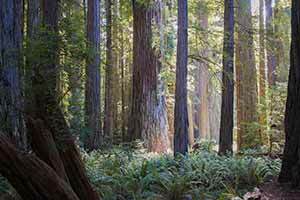 About a third of the sites are in areas that naturally don’t have any redwoods. 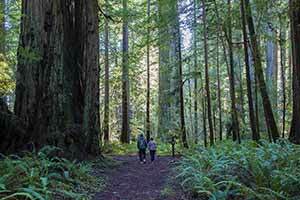 In the map above, areas of old-growth redwoods are dark green. 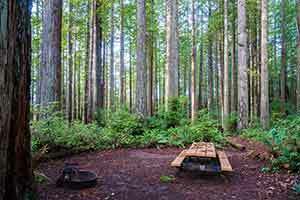 Every site has a fire pit, a picnic table, and a food storage locker. 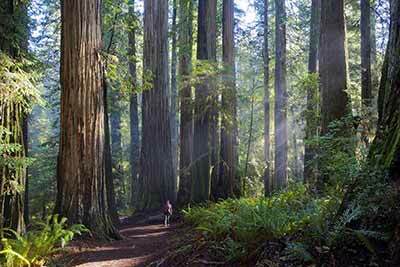 All of the North Coast redwood parks are very strict that every crumb of food must be stored in the locker unless you’re actually eating. Animals that live around campgrounds get really bold when people leave food out; raccoons, for example, have no issue tearing into tents while people are inside. 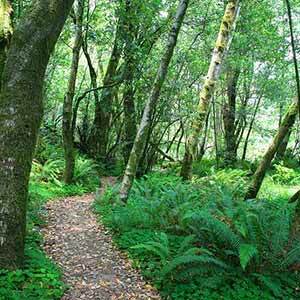 Within the campground is a short trail loop, the River Beach and Nature Trails, which is OK for a short walk but not nearly as good as going across the river to Stout Grove. 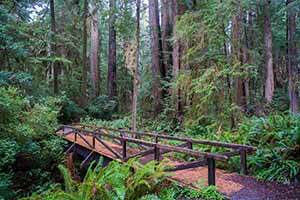 The trail has fewer redwoods than most other parts of the campground, in part because the vegetation along the trails is so dense that it’s hard to see very far into the woods. 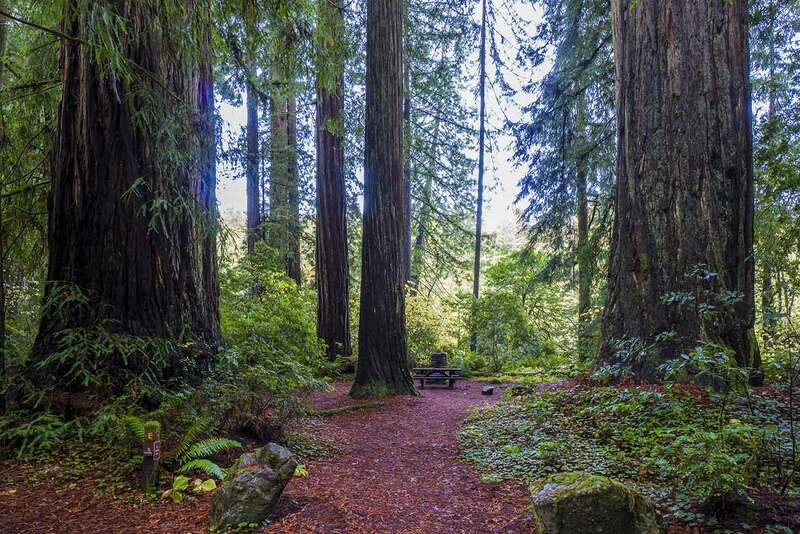 There’s also a nice picnic or “day use” area in one of the more impressive old-growth groves within the campground; you can park under the redwoods or drive onto a gravel beach by the river. This is the only part of the park that charges a fee if you aren’t camping. 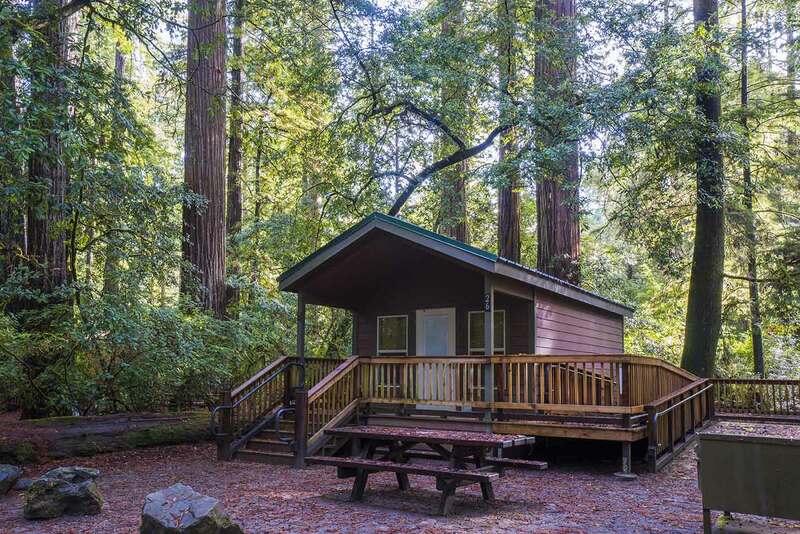 A tiny state park visitor center is also located in the campground; on summer weekends it offers ranger-led walks and educational talks at the neighboring campfire center. A larger national park visitor center is across the highway. There’s a nice new bathroom and pay shower building next to the visitor center (bring lots of quarters), and a new bathroom in the day use area; the other bathrooms are older and not as nice. The area has a lot of mosquitos in summer. The campground is open all year. Reservations can be made up to 6 months, but not less than 2 days, before the first night of a stay. 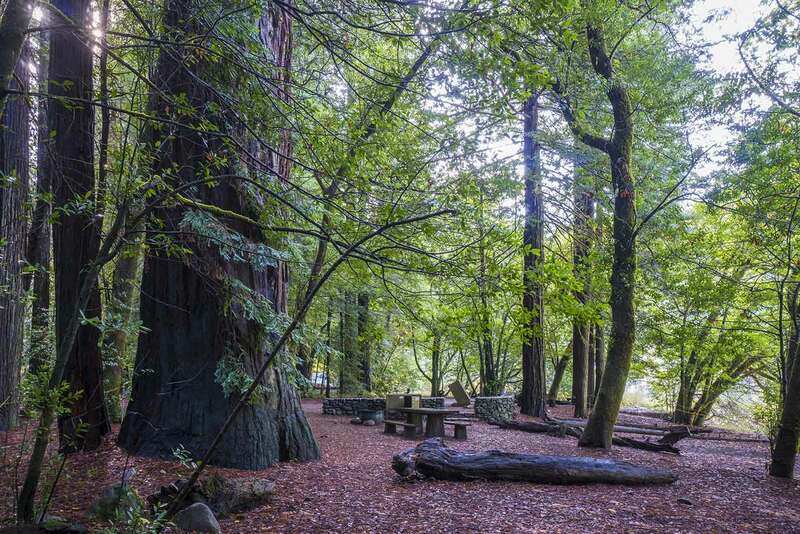 Sites 48 – 57 are the campground’s best sites. 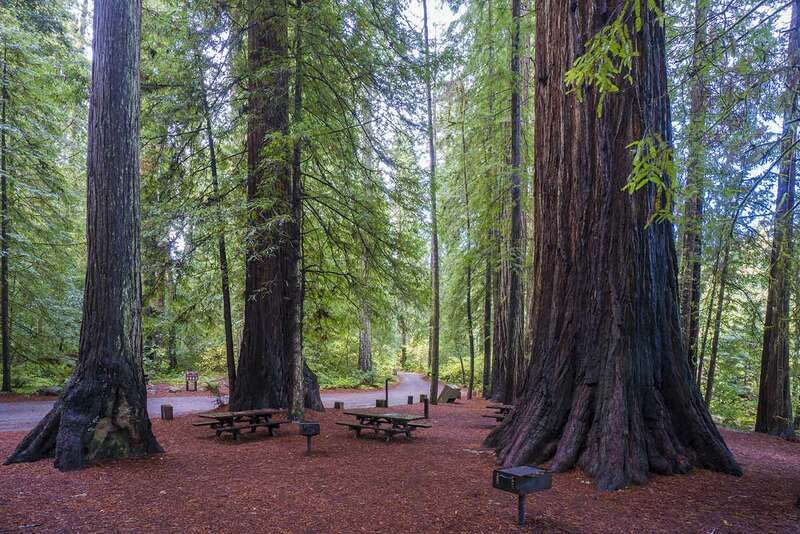 They’re on a redwood-shaded riverside terrace below the rest of the campground, so they’re well-shielded from traffic noise by a 40-foot-high embankment. 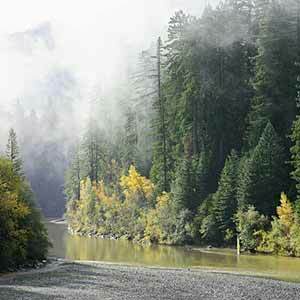 If the river is high enough any remaining traffic noise can’t be heard at all over the rushing sound of the water. This is unfortunately one of the few areas in the campground that’s been logged, but even so it still has the biggest trees. 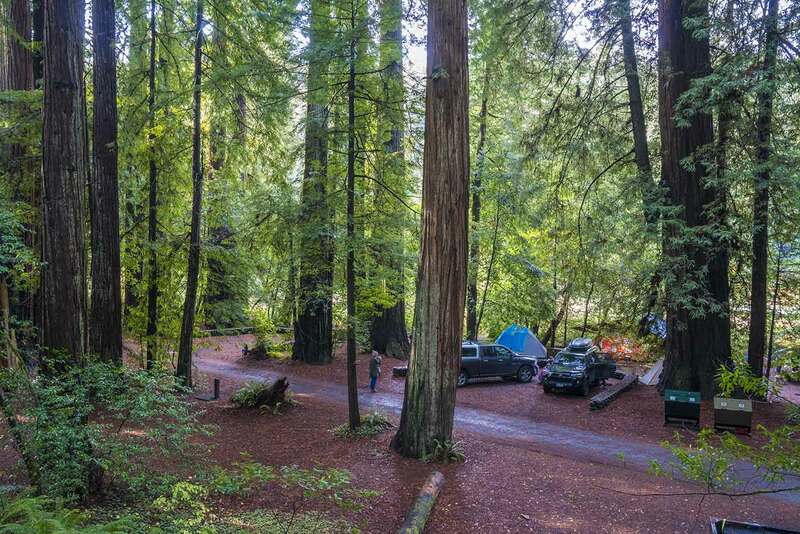 Two walk-in sites, A and B, are in the nicest part of the campground, next to some huge redwoods, by the river and in the part of the camp that doesn’t get any traffic noise. To reach the campsites, you have to park in the pullout a few sites away and walk about 100 yards. The sites feel a little more isolated than the regular sites and you won’t have cars driving by. The two sites have one big, common fire pit. 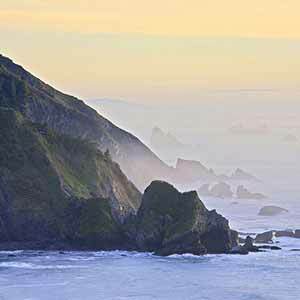 Many state park campgrounds, especially the ones on the coast, have hike/bike sites that are mainly intended for long-distance touring cyclists. Such cyclists may not have an exact itinerary planned in advance, so the hike/bike sites provide a network of places where they can drop in and camp without reservations. 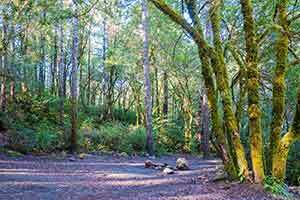 Jed Smith’s hike/bike sites are unusually nice; there are five of them instead of one, and they’re set well apart from the rest of the campground. They are, of course first-come, first-served and can’t be reserved, and vehicles are not allowed. The nightly fee is only $5 per person. 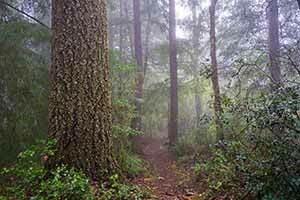 There aren’t any showers or restrooms, but you can use the showers in the main campground and the nearby picnic area restrooms. 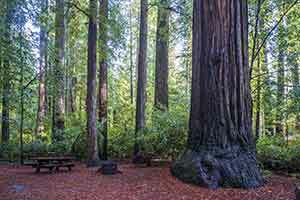 The campground has four cabins in a rather nice old-growth redwood grove. The cabins are pretty basic; each has four bunk bed platforms (two bunk beds, each with a full-sized platform below and a twin-sized above), electrical outlets, and, crucially, an electric heater. You have to bring your own bedding. There’s no bathroom or kitchen, and you’re not allowed to cook inside. In fact, there isn’t even any place to sit inside other than the bunk beds. 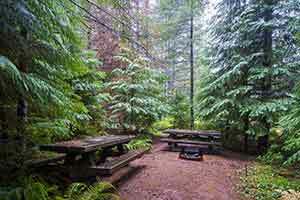 However, like the regular campsites, each cabin has an outdoor picnic table and fire pit. All the cabins are wheelchair accessible. 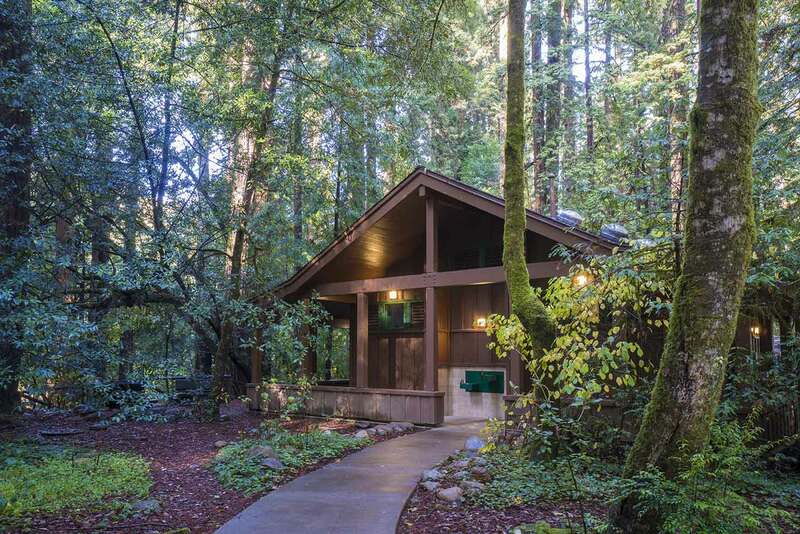 The cabins are quite clean and in great condition. 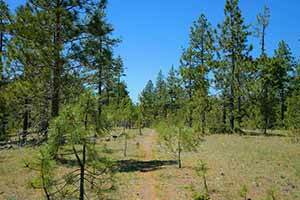 First choice: sites 50 – 56, walk-in sites A – B, or the cabins. 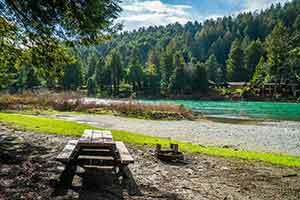 In particular, site 55 has everything: it’s on the river, it has big redwoods, it’s near, but not too near, the nice new bathrooms and the visitor center, and it’s near a water spigot. Second choice: sites 47 – 49, 57 – 60. 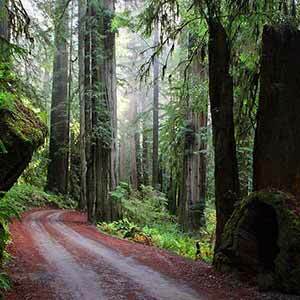 The redwoods aren’t as nice and the sites aren’t as well shielded from the traffic noise. 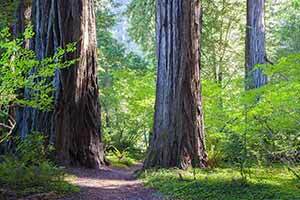 Third choice: Sites 78 and 80 are in some pretty nice redwoods and far from the highway, although they do get a little traffic noise. 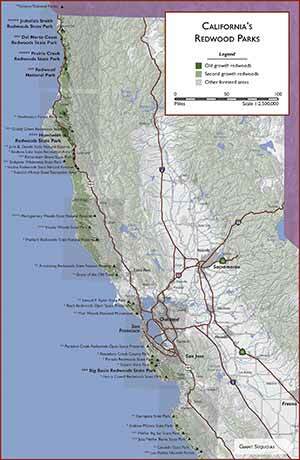 Fourth choice: Sites 13 – 31 are still in the redwoods but are closer to the highway. 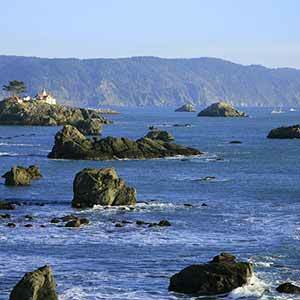 Make reservations with ReserveCalifornia; search for Jedediah Smith. The best sites are on what they call the “outer loop”. Part of the campground is on Google Street View.